We go through tutorial to demonstrate the functional programming concepts built into React.js, and how to unit test the app we create. I'm currently creating examples that continue with the functional programming theme. In these examples, I'll be using the game of poker to demonstrate various techniques for writing self-documenting and terse, functional code. 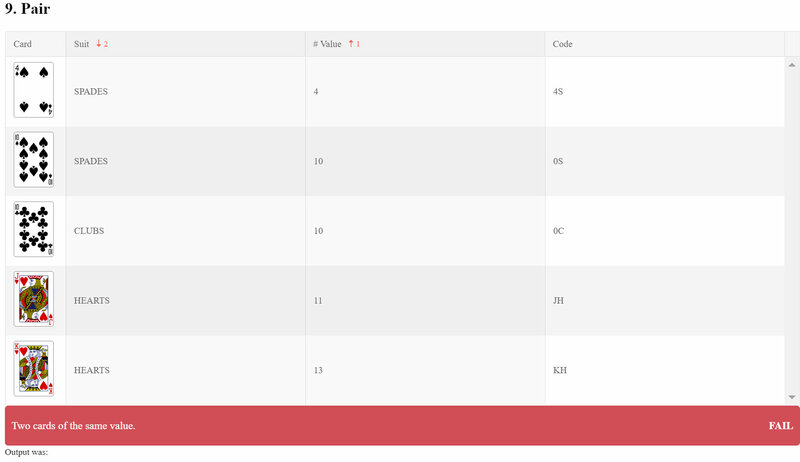 To help visualize the data used in the examples, I decided to create a simple visual unit testing component using React. The component is part of a simple app for teaching concepts around scoring a hand of poker using functional programming. With so many great unit testing frameworks available for React it wasn't an easy decision to create yet another method of testing code. However, I really wanted to make something custom for the subject matter that didn't introduce another concept such as a unit testing framework that comes with its own learning curve. Instead, I wanted something that could allow students to focus on the code used in the demo. In my content, I try to create visual elements that help students connect with the idea being presented. I find that playing cards are relatable since they present a real-world object. Another convenient property of playing cards is they display their values thus making them distinguishable at-a-glance. The goal of the visual unit test is to display a hand of playing cards images along with their corresponding values. With this display, I'll include the desired poker score result, description, and pass/fail value. The final result will be a project users can open using StackBlitz and begin writing code to light up the unit tests. Everything they need to get started will be ready to go out-of-the-box. The visual unit testing app is driven by a single file which wires everything up. The test.js file marries the test data, units under test, with an array of test configurations. In this scenario, I'm testing two public functions that the student is responsible for creating: getHandRank(), which scores every poker hand available in a game of five card poker, and getHighCard(), a function which must return the highest card object in a hand. A test configuration consists of the name, data, the actual value (the unit under test), the expected value and the description. The actual and expected values are used by the visual unit test component to determine if the test is pass/fail. Internally, the visual unit test component is performing a deep-equals against the two values to produce a "passing" value. Once a pass/fail is determined, the unit test will display the corresponding color, text, and output value. React Hooks: What’s Going to Happen to React Context? Published at DZone with permission of Ed Charbeneau , DZone MVB. See the original article here.